I have a crush on a cookbook, “The Family Calendar Cookbook”, written by my food-writing friend, Kelsey Banfield. You can check out Kelsey’s site, “The Naptime Chef” here. Every recipe I have tried from her latest cookbook works perfectly. Last spring, I posted my version of her simple and delicious Peach and Tomato Salsa. Browsing through her mouth-watering collection of summer recipes, I settled on her Rhubarb Yogurt Cake featured on page 140. Both Kelsey and my husband Larry are huge rhubarb fans, and I knew Larry would vote for this one. Unfortunately, there was not a stalk of rhubarb to be found here in San Diego this week. Undaunted, I settled for some pretty Dragon Plums and made a plum yogurt cake instead. These plums are pinky-red skinned with bright red fruit. I love the simplicity of a yogurt cake, rich and moist without a bit of butter and no need for frosting, perfect for summer gatherings. A lazy baker, I also like not having to clean my mixer either…The next time I make this, I might add 1/4 teaspoon of lemon zest to the batter to maximize the taste of the plums. With rhubarb, I don’t think you would need the lemon. LtC TIP: I use Hain no sodium baking powder in my low salt kitchen. 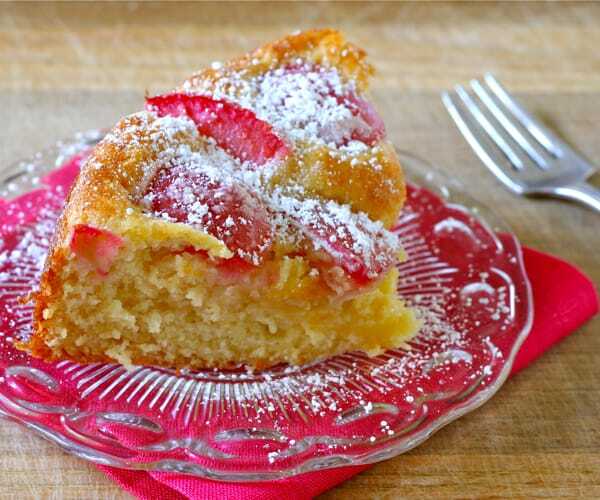 A simple yogurt cake using summer fruit of your choice. Preheat the oven to 350 degrees. Lightly oil a 10-inch springform pan and set aside. In a large bowl, whisk together the yogurt, sugar, salt and almond extract until smooth. Add the eggs, one at a time, whisking until the batter is thick and smooth. Sift together the flour, baking powder and baking soda in a small bowl. Use a rubber spatula to gently fold the flour mixture into the wet ingredients. Pour the batter into the prepared pan and use a spatula to gently smooth the top. Gently toss the plums with the remaining flour and sprinkle on top of the batter. Bake 40-45 minutes until a cake tester comes out clean and the top springs back when gently touched. Allow the cake to rest in the pan for 10 minutes before removing sides. Dust with powdered sugar, if desired, and allow the cake to cool before serving. Looks perfect Liz! Alas, no Rhubarb on this coast either 🙁 But those plums look fabulous, I love the red ones for jam as well, such a gorgeous jewel tone. This is going on my must try list, I have peaches in the house, I imagine this with ginger and lemon as well. Sounds wonderful. I will have to check out Kelsey’s cookbook! It’s a lovely book, Lynda – so clever and packed with tips and great recipes. Glad you got to see the cookbook, Greg – it’s a winner. I love this Liz! And your website- it’s amazing! What a unique and innovative concept- I can’t wait to follow your posts! Where in SD are you located?! I have always wanted to try making a yogurt cake. I’ve seen French versions that are essentially a way to get kids into the kitchen, where you use the yogurt cup to measure the other ingredients. I’ll have to give this a try! This one is a snap, Lisa – any chopped up summer fruit will work – and the yogurt makes a dense, moist cake. Do you think light brown sugar could be used instead of white? Hi thanks for this recipe – it’s exactly what I was looking for. Just a question about the cooking oil – when are you supposed to add it to the mixture? When you add the wet ingredients – sorry!